At Hueco Tanks State Park and Historic Site, unique geology and rainwater create a sanctuary for living things. 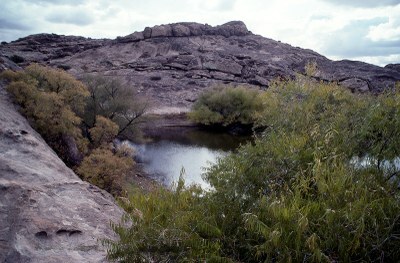 Hueco Tanks lies in the southeast part of the Basin and Range physiographic province. In this province, broad flat basins separate isolated and nearly parallel mountain ranges. The Spanish called these basins bolsons, meaning large purse. The park is in the north end of the Hueco Bolson, which extends southeast along the Rio Grande. The Hueco Mountains (to the east) and the Franklin Mountains (to the west) flank this part of the basin. When you approach the park, you will notice three low mountains rising from the Chihuahuan Desert. Around 35 million years ago, an underground mass of hot magma (or molten rock) pushed upward here, and then cooled under a layer of limestone. Over millions of years, wind and water wore away the limestone covering. These same elements then sculpted the mountains’ igneous rock (or cooled magma) into its current form. The ig­ne­ous for­ma­tions in the park cap­ture pre­cious rain­water to create a rich oasis in the arid desert. Water comes to Hueco Tanks in a variety of ways. Runoff from the Hueco Mountains flows through arroyos on either side of the park. Within the park, cracks in the igneous rock capture rainwater and channel it downward. Cracks and hollows (huecos in Spanish) in the rocks also hold rain, hence the park’s name. Most of these huecos occur naturally, but early residents built dams and tanks, too. The huecos hold water for several days to several months. How long a hueco holds water depends on the size of its pool, and whether it is in open air or protected from evaporation. Not only do the mountains conserve rainwater, they also provide shelter, shade and pockets of fertile soil that create “microhabitats.” These microhabitats allow species not normally found in the desert to survive here. Hueco Tanks State Park is home to a much wider variety of animal species than the surrounding desert. We see carnivores such as bobcat, gray fox, coyote, javelina, badger, ringtail, skunk, raccoon and mountain lion (or their tracks) regularly. Three types of rabbits forage in the park: black-tailed jackrabbit, desert cottontail and eastern cottontail. A number of rodents live here, and six species of bats roost in these rock hills. Not surprisingly, many reptiles live here, too. Five rattlesnakes native to the Trans-Pecos region have been spotted: blacktail, Mojave, mottled rock, western diamondback and prairie. They join 25 other species of snakes in the park. 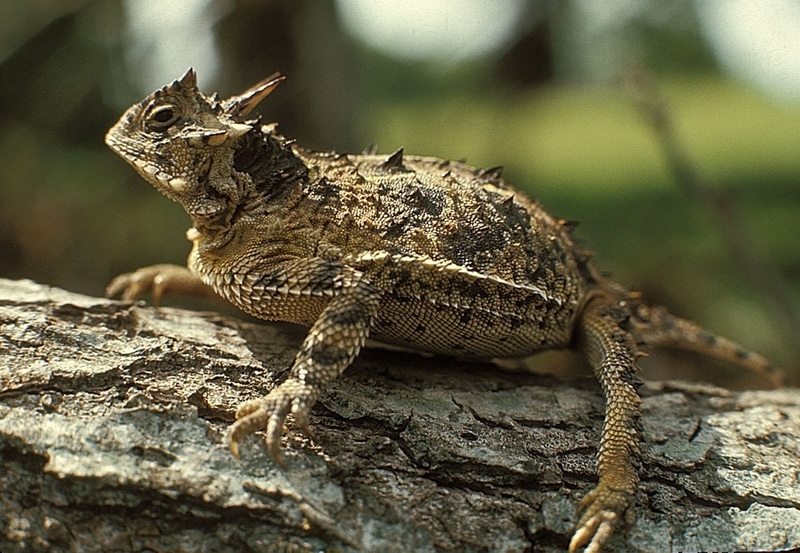 Other reptiles include 17 species of lizards, one of which is the Texas horned lizard. Seven amphibian species usually found in wetland areas have also been seen here. These include six species of toads and the barred tiger salamander. More than 200 species of birds have been recorded at Hueco Tanks. Around 44 species may breed here, including the prairie falcon, burrowing owl, white-throated swift, ash-throated flycatcher, blue grosbeak and Scott’s oriole. Many wading birds, waterfowl and shorebirds stop at the park during migration periods. Migratory songbirds spend time here in the spring and fall. More than 20 sparrow species overwinter at Hueco Tanks. “Fairy” Shrimp: Tiny, translucent freshwater shrimp live in the huecos. These little fellows lie dormant until it rains. Then they spring to life, and become food for predators like lizards. Just for Kids: Desert Dwellers. 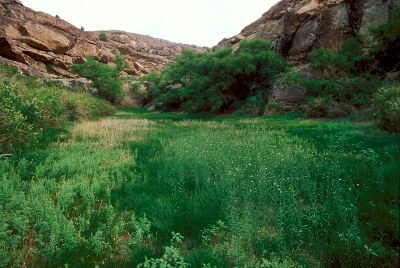 The park hosts an interesting mix of plant species from desert, mountain, aquatic and grassland habitats. Desert scrub and grasslands of the Chihuahuan Desert surround the mountains. Creosotebush, honey mesquite, ocotillo, lechuguilla, sotol, prickly pear and other cacti grow here. Grasses include gramas, goosefoot and amaranth near the rocks and fourwing saltbush and other grasses on the desert flats. In narrow canyons and at the base of hills, moist habitats and ponds support mature trees and other plants. Tree species include netleaf hackberry, Texas mulberry, Mexican buckeye, Arizona white oak and rose-fruited juniper. 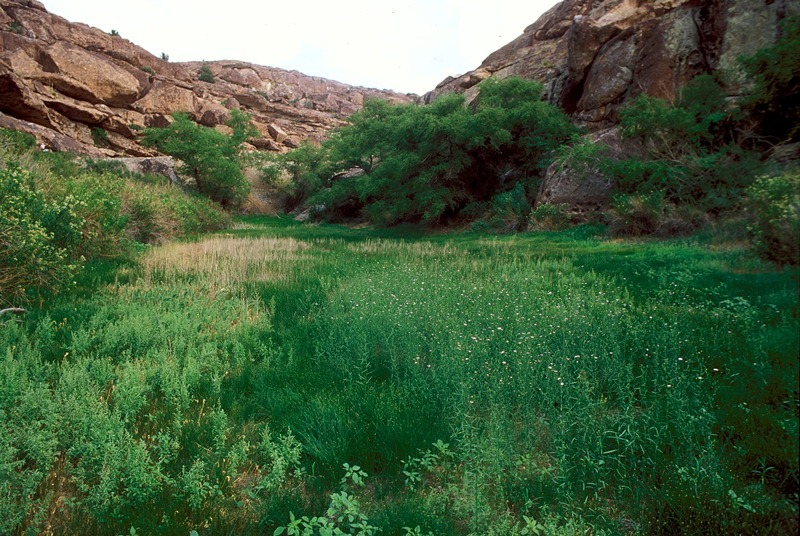 Water-loving plants like leafy pondweed, hairy pepperwort and Rio Grande cottonwood thrive in moist soils near dams and seeps. Look for a few rare-to-Texas plants. The only known population of erect colubrine (Colubrina stricta) in the United States grows here. Abutilon mollicomum, a tall spindly mallow, grows in two locations in the park. Mosquito plant (Agastache cana) grows on rocky slopes, crevices and ledges in the western Trans-Pecos and New Mexico. This perennial grows only in a small area, but thrives in the park.